Diamond Solitaire Engagement Ring Beauty and simplicity stands out with a Diamond in an elevated four prong setting ensuring that this 1.00 ct Solitaire Ring sparkles from every possible angle. 5 stars, based on 1 reviews Condition: $6496 New In stock! Order now! Order in 5:42 hrs to get it by 25th Apr 2019 with Overnight Delivery Learn More. Normal processing time for this item is 2 to 3 business days before it ships and it will ship via your chosen ship method after the processing time is complete. 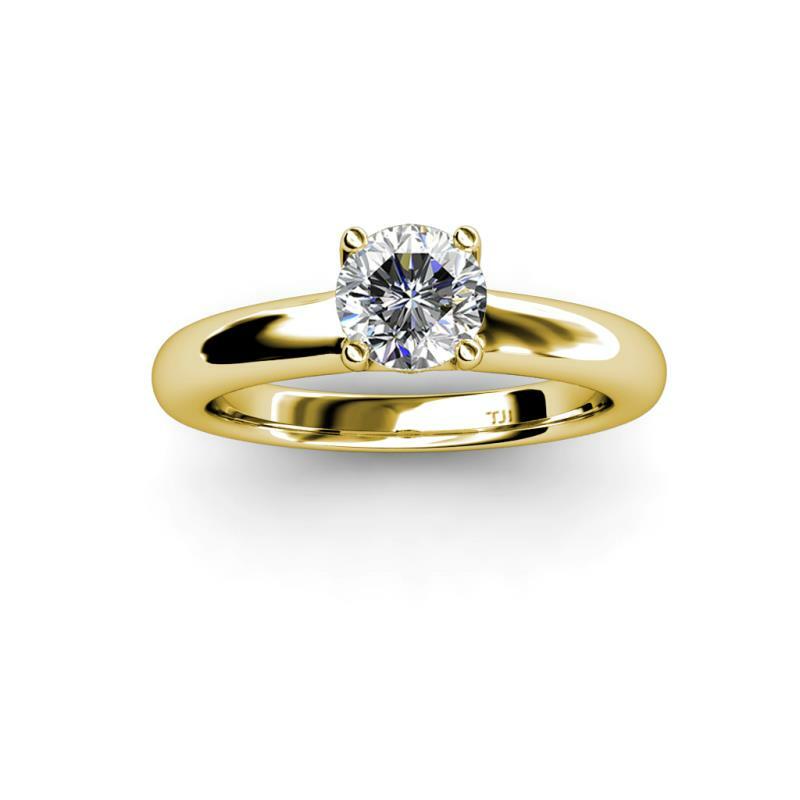 Beauty and simplicity stands out with a Diamond in an elevated four prong setting ensuring that this 1.00 ct Solitaire Ring sparkles from every possible angle. 1.00 ct Diamond Solitaire Ring. 1 Round Diamond set using Prong Setting. I have purchased several rings from TriJewels and am thrilled with the quality of the rings and the customer service offered by TriJewels. I highly recommend them! Absolutely amazing experience working with Vijay and Trijewels. Hands down best experience I've ever had with a jeweler. If you want a personal reference Vijay can put you in touch with me. I was looking for someone to help me custom build my engagement ring in the New York City area. A friend of mine recommended Trijewels and got me in contact with Vijay. Vijay started by giving me a thorough education in diamonds and the custom build process. Once we decided on a budget, he helped me narrow down my diamond search and custom ordered a diamond from a dealer only available to wholesalers and not available to the general diamond searches online. He had me come in to check the diamond and allowed me to keep it if I wanted too while we were designing the ring. The ring I wanted did not exist on any website I could find (I checked literally hundreds) so I provided Vijay about a dozen pictures that individually contained the elements I was looking for. We had a number of calls and meetings to discuss the design. When I asked Vijay for a design element that was not physically possible he took the time to carefully explain why what I wanted wasn't possible and provided me alternatives. In the process, Vijay provided me a 3D CAD drawing and a plastic model of the ring before we finished to make sure that I was happy with the design. This was very important since seeing things online is not remotely the same as in person since the ring is much much smaller that the picture. Many of Vijay's design recommendations were given with this in mind and it made a huge difference. In case you were curious - my design was a Kite set, princess cut diamond in a platinum band with a u-prong pave. The pave has the first diamond floating in the air. In the end the ring is exactly what I wanted and much more importantly my fiance absolutely loves it. This is my 3rd purchase from Trijewels.com - from Vijay Bhatia in particular. At one point, I did the usual thing of visiting all the jewelry shops in the area - then a very close friend recommended Vijay. I did my first jewelry purchase (diamond ring) from Vijay a couple of years ago. I chose something online - Vijay and I had an email correspondence and on his advice, I ended up changing my selection. Subsequently, I have purchased more diamond jewelry from him. Vijay's service has been exemplary ! He is very prompt in replying to his mail and is always ready with helpful advise. It has been a pleasure doing business with Trijewels.com and Vijay in particular.